Refresh your work wardrobe with the Top Dog Shirt by Gorman! Made from 100% cotton voile, the printed shirt is accented with a pointed collar and blouson sleeves with fitted cuffs. Wear it day or night by hiring it for an upcoming work function or cocktail party. Dress up the shirt for cocktail hour by styling it with a pair of high-waisted palazzo pants and strappy high heels. Complete the cool look by renting a white embossed pod for your evening staples. Head over to our blog for hairstyle ideas to try for cocktail parties! 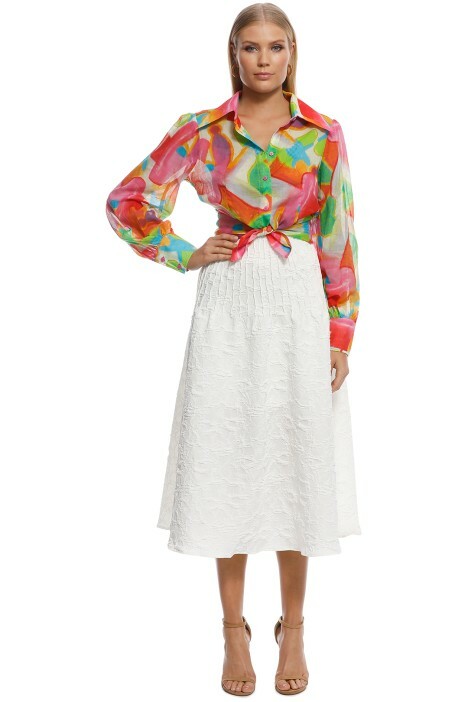 Pair this fun shirt with a white skirt or try Brooke Textured Full Skirt by Friend of Audrey. With standout prints and coveted designs, Gorman is one of the go-to labels for stylish Australian women. Launched in 1999 by Lisa Gorman, the brand prides itself on sustainable and organic creations through whimsical prints and vibrant colour palettes. Gorman has 34 stand-alone stores in Australia and 2 in New Zealand and has gained a cult following since its inception. BUST: Closed fit. Refer to the size guide for specific measurements. LENGTH: The shirt is hip length. GREAT FOR: Suitable for all body types.